Nearly have of the people in the United States with diabetes have some type of nerve damage, especially affecting their feet and legs. 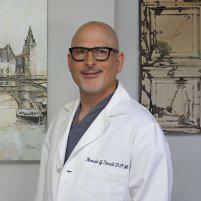 At Comprehensive Foot Care Associates in Abington and Fort Washington, Pennsylvania, Dr. Ronald J. Small offers advanced diagnostics and treatment options to alleviate neuropathy pain and prevent serious medical conditions, including amputations. To learn more about treating neuropathy pain and other complications, schedule an appointment online or by calling the office nearest you. Diabetic neuropathy is a type of nerve damage that usually affects your feet and legs when you have diabetes. The cause of the nerve damage is high blood sugar that injures nerve fibers and results in a number of problems, including chronic pain and the increased risk for infection. Because neuropathy can reduce the sensations of pain in your feet, ulcers and infection can go unnoticed and result in permanent foot deformities and chronic pain in your joints and bones. It can also result in the loss of your limb. Untreated infections can break down your skin and easily spread to your bone. If this happens, you can develop gangrene, the death of tissue, and require the amputation of your toe or foot. In some cases, the spread of gangrene can result in the loss of your entire lower leg. For these reasons, it’s important to properly manage your blood sugar daily and visit with Dr. Small for a routine foot evaluation. Dr. Small typically reviews your medical history and your current symptoms to determine if you have diabetic neuropathy. He also checks your muscle tone and strength and may test your reflexes during a physical exam. To confirm a diabetic neuropathy diagnosis, Dr. Small may also request more comprehensive tests, including nerve conduction studies or an electromyography (EMG) to evaluate the nerve signals in your legs and feet. What treatment options are available for diabetic neuropathy? There is no cure for diabetic neuropathy. Dr. Small can treat your symptoms as needed. He focuses on slowing the progression of the condition by ensuring you’re managing your blood sugars and cleaning your feet properly. To treat ulcers and infections. Dr. Small can use topical medications to clear infections and keep them from spreading. MLS laser therapy is also available to reduce your pain and stimulate new cell growth for faster recovery of ulcers and infections. To learn more about preventing diabetic neuropathy, schedule an appointment online or by calling the office.